Coalesce is one of those favorite words—an elegant, mystically dynamic word that describes the particular transformation that occurs when things come together. Getting things to coalesce is sometimes a key goal in life: when a project and its funding coalesces, the project can become a reality; when characters and plot point coalesce, a good story can be written. When Linna Thomas sailed down the California coast from Oregon after graduating from college, she found a friendly port called Morro Bay. When she decided to stay and co-found her bookstore in the 1970s, her love of words and her sense of timing and opportunity coalesced and she created a unique independent store that has now been a Morro Bay landmark for thirty years. Once you peer into the beautifully gilded late glass window and find yourself wandering through the book shelves, you discover a back door that leads to a beautiful garden where a charming little chapel is nestled. The complex hosts not only book signings but classes, parties, and even wedding receptions. The store caught my attention several years ago when I was on one of my many Central Coast research runs. Though my fictional town Milford-Haven is located about thirty minutes and is loosely based on Cambria, my story naturally expanded to include Morro Bay with its harbor and boating, qualities that make it distinct from my other story locations. Authors always have to make choices about what to fictionalize and what to report authentically. The heart of my story had to be a fictional town to give me maximum freedom to tell my story. Yet the fictional Milford-Haven is surrounded by the real towns that dot the California coastal map, including Morro Bay. Having decided to include this real town, of course I had to do my homework and include real places. I knew I wanted a bookstore as my starting point, and when I found this one, ideas . . . coalesced. My story is set in the late 1990s. Was the store actually there at the time? In my new novel Where the Heart Lives, my character Samantha wanders in, just as I did myself. What fun it was to research the actual books she’d have found displayed on the shelves back then, and to give my readers this anchor as they float through time in my story. Imagine my delight when the real Linna invited me to do a real book signing in her real bookstore as the starting point of my California book tour! 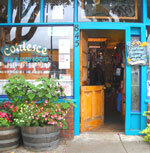 If you’re in the Morro Bay area, Coalesce has a few signed copies of my new novel Where the Heart Lives. Or you can order your hardcover or e-book at your favorite on-line bookseller. And don’t forget that my gift to you is the FREE short story prequel, When Whales Watch. The special page where you can find links to all e-book readers, or a PDF download if you don’t have an e-reader is www.MaraPurl.com/downloads. Join me in Milford-Haven and discover where your heart lives.